One solution is higher-quality tooling paired with higher-quality brass, which helps mitigate the challenges in working with the malleable material. Bunters (pictured) or head stamps, both produced by Wilson Tool, are created using a patented manufacturing process that reportedly can increase tool life by 500 to 800 percent as compared to similar tools produced via traditional processes. If an ammunition manufacturer produces 1200 rounds/min. and the production line shuts down for 5 min. to change a worn or broken bunter, that lost time translates to 6000 lost rounds. A higher-quality bunter or head stamp garners savings in longer-lasting tools and reduced downtime. Keep in mind that traditional methods for creating branded or otherwise labeled characters on brass casings include burning or electric discharge machining (EDM), which creates a white layer during the hardening process that weakens the casing. Because the EDM or burning process micro-hardens the very edge of those casing characters, it changes and weakens the molecular structure of the material, making it easier for characters to chip away. Forming on the other hand, stamps the characters into the brass casing, which creates a stronger molecular bond in the brass. This delivers a better surface finish, more polish and a stronger molecular capacity, which creates a higher quality brass casing. Repeatability and consistency are additional benefits gained by manufacturers using the forming process for creating premium rounds and meeting the quality standards expected by military and law-enforcement organizations. Using bunters designed and manufactured for forming rather than for burning delivers tighter tolerances and a clean, smooth finish. Characters on each individual brass casing appear identical to one another, whereas the EDM process leaves slight variations. 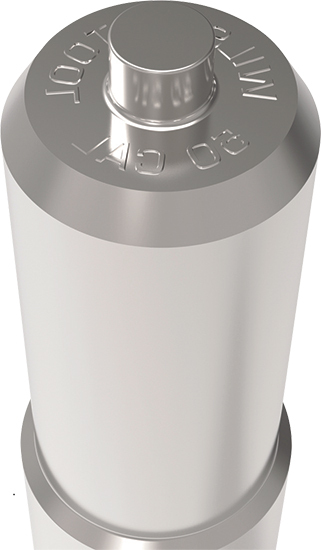 While bunters and head stamps are relatively straightforward to use, different machines often call for different approaches to maximize production and prolong tool life. When implementing form tooling, ammunition manufacturers can take a variety of approaches depending on the type of machine in the shop, whether using a flywheel on a ram, a turret press or traditional stamping press. Some machines simply perform bunting applications better than others. In turret systems, a vertical tool setup often provides longer tool life because compression occurs at a more consistent pace. Conversely, ram-style systems deliver a brute force in this application, with mechanical results that may not be 100-percent consistent. Machining and tool steels have come a long way since the 1950s and ’60s. Then, tooling manufacturers commonly used O1 or A2 steels, acceptable for the consistent and universal processes used to manufacture ammunition. Some advanced machining techniques used today, however, such as milling, grinding or turning, now are applied to the ammunition industry. Considering the different tool steels and how individual steels function during a drawing process, or a trim or process, helps determine how the steels respond to different stresses, which helps toolmakers create custom tools designed for different applications. For example, a draw-tooling application requires a tool steel that can withstand the stress of material stretch, maintain its final form and be flexible while experiencing extra pressure. Turning a part, on the other hand, needs a different tool steel that can hold a cut edge better without prematurely chipping or wearing. Matching the process and application with ideal tool steels helps ammunition manufacturers select better bunting tooling specifically designed for their machine, and effectively utilizes the characteristics of those steels. Tool coating also plays a vital component in creating premium ammunition. For example, during the draw process, added lubricity in the coating makes a difference, but when performing a trimming or cutting process, a harder surface coating is important.